Co-producers, directors and editors, Christine Mallet and Randal Kazarian, have been living in Santa Barbara, California for the past 30 years, and the city’s annual week long Fiesta celebration has always been something they look forward to. 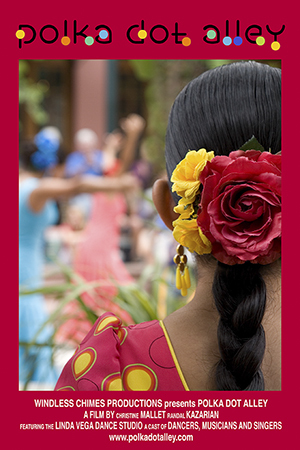 While attending Brooks Institute, Randal spent a good deal of time photographing flamenco with the hopes of someday filming the choreographers, dancers and musicians. This all became possible thanks to the first affordable pro HD film cameras introduced by Panasonic in 2006. As first time feature filmmakers, both have been tested on a wider range of projects in their respective careers – Christine, after earning her degree in Graphics and Visual Communications at UCSB, as a production manager for a 300 page monthly magazine, and Randal, with several issued US Utility Patents, as a product designer with a strong knowledge of CAD and animation. Mallet and Kazarian started working as a team over 20 years ago developing animated corporate websites and directing film shoots and television talk shows for their clients. The blog has been created to follow the progress of a feature documentary and story about one of Santa Barbara’s most celebrated choreographers, Linda Vega. The filmmakers began researching the project in March of 2008 and preliminary filming began a month later. After following the Linda Vega Dance Studio through the end of their 2008 Fiesta season, production began in the fall. While filming behind the scenes and over the course of 4 years, anything can happen – and of course the unexpected did. Because we have 3 stories we’ll be releasing 3 feature length films titled Polka Dot Alley ~ a flamenco dance trilogy. A fine-cut of Polka Dot Alley, part one, the Red & Blue Shoes, featuring Talia and the studio’s 2009 & 2010 seasons previewed at the Lobero Theatre, in Santa Barbara, on July 23, 2014. The New Vic Theatre, in Santa Barbara’s Historic Theatre District, was home for the cast screening of the trilogy, in May, 2015.